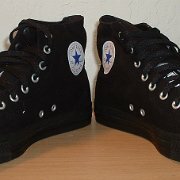 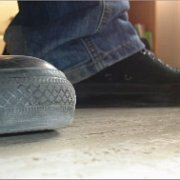 Photo gallery of mostly all black chucks made in a single color. 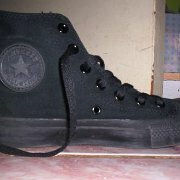 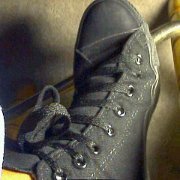 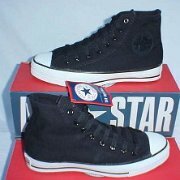 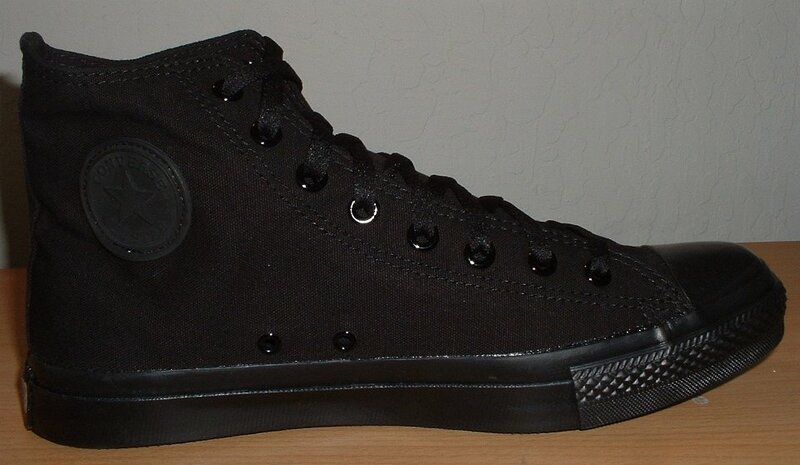 1 Monochrome Black Chucks New left black monochrome high top, made in China, outside view. 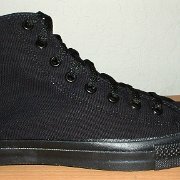 2 Monochrome Black Chucks New right monochrome black high top made in China, outside view. 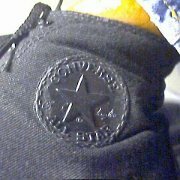 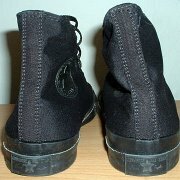 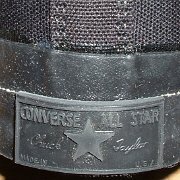 3 Monochrome Black Chucks New left monochrome black high top, made in China, inside patch view. 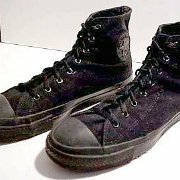 4 Monochrome Black Chucks New left black monochrome high top, made in China, outside view. 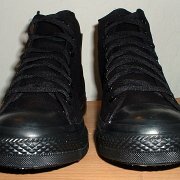 5 Monochrome Black Chucks New black monochrome high tops, made in China, rear view. 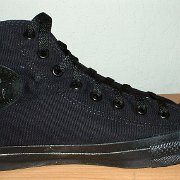 6 Monochrome Black Chucks New black monochrome high tops, made in China, front view. 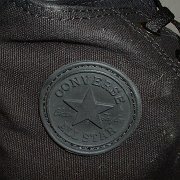 7 Monochrome Black Chucks Close up of the inside patch. 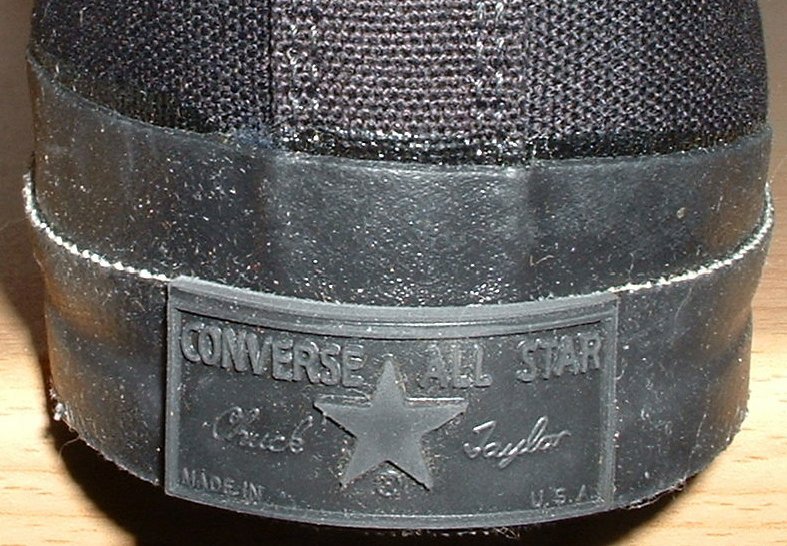 8 Monochrome Black Chucks Closeup of the heel patch of a made in China black monochrome high top. 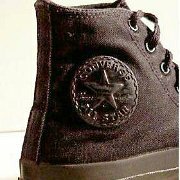 9 Monochrome Black Chucks Inside patch view of new made in China black monochrome high tops. 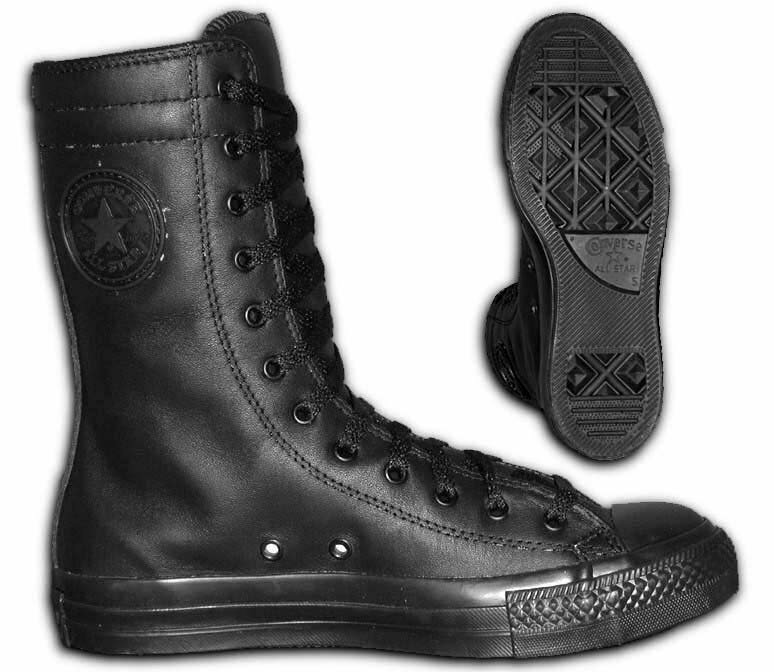 10 Monochrome Black Chucks Catalog views of a black monochrome extra high leather shoe, showing the inside left patch view, and the sole view. 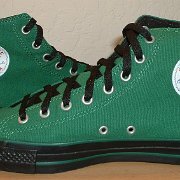 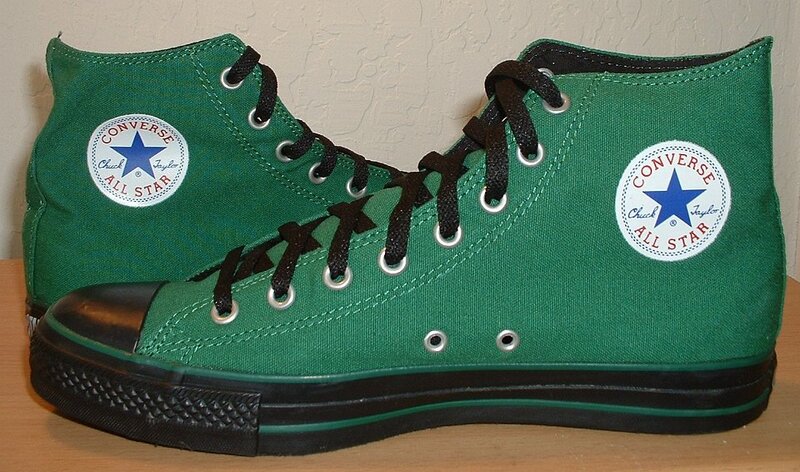 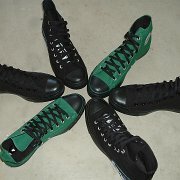 11 Monochrome Black Chucks Goth model chucks are built on the monochrome style, but with two colors and standard side patches, like these 2005 green and black high tops. 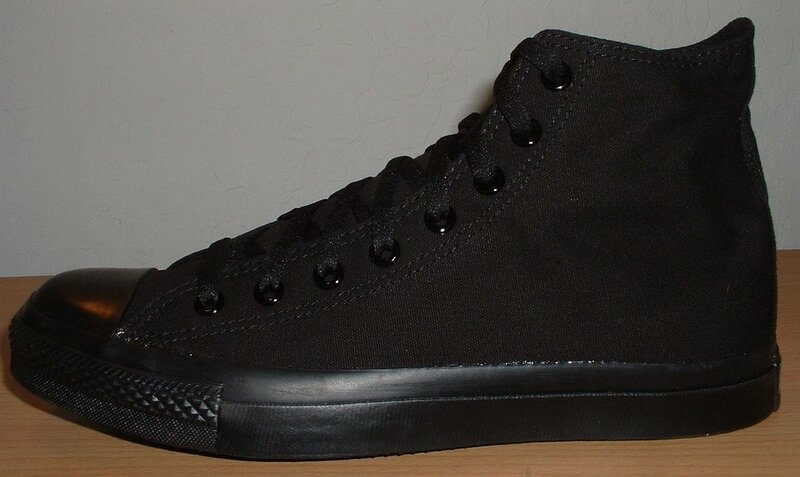 12 Monochrome Black Chucks Side view of a right monochrome black low cut. 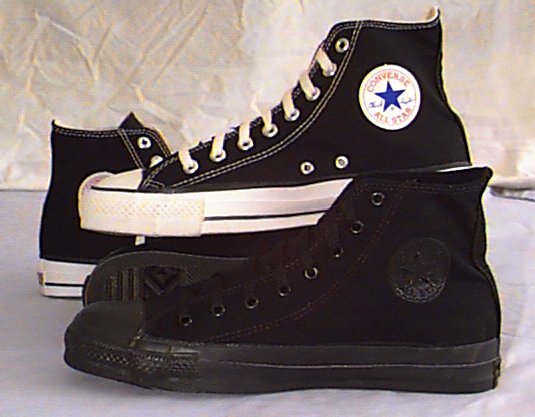 16 Monochrome Black Chucks Front and rear views of monochrome black high tops. 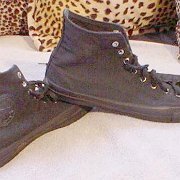 20 Monochrome Black Chucks Worn black monochrome high tops, side and sole views. 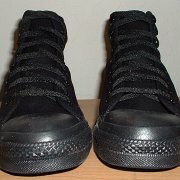 21 Monochrome Black Chucks Worn black monochrome high tops, front to side view. 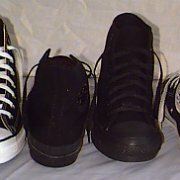 22 Monochrome Black Chucks Worn black monochrome high tops, front and rear views. 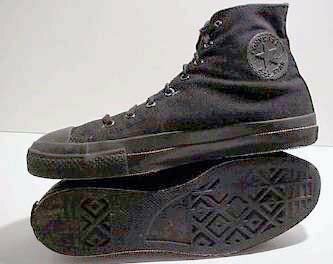 23 Monochrome Black Chucks Angled side view of a made in Asia right monochrome black high top from a catalog. 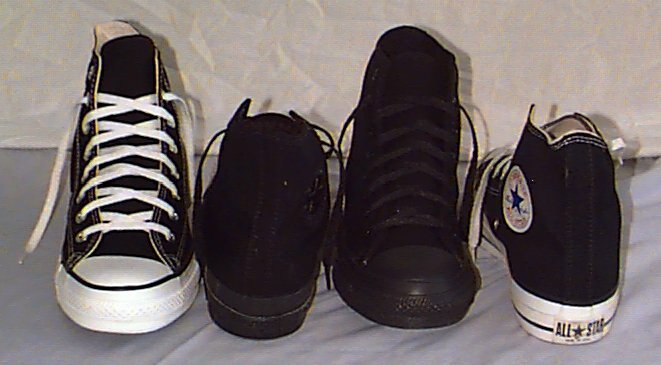 25 Monochrome Black Chucks Classic and monochrome black high tops. 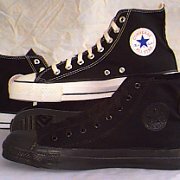 26 Monochrome Black Chucks Classic and monochrome black high tops. 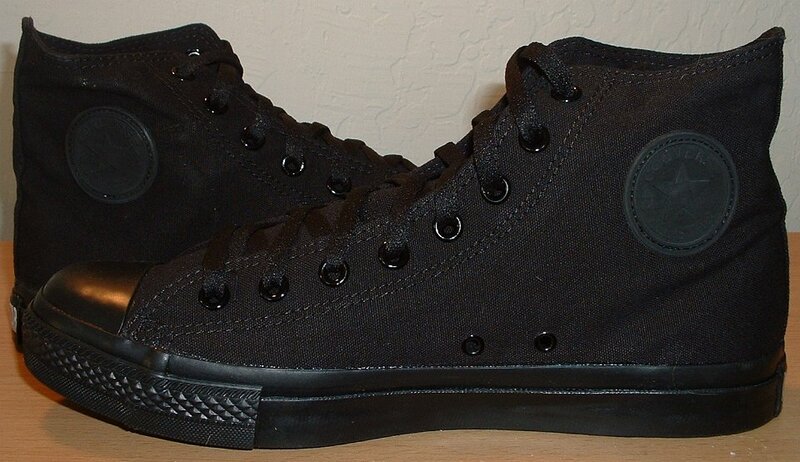 27 Monochrome Black Chucks Angled side view of monochrome black high tops. 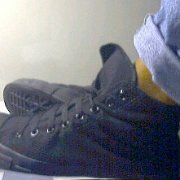 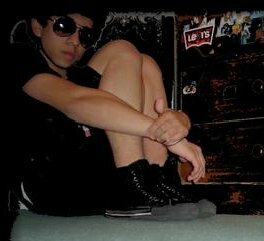 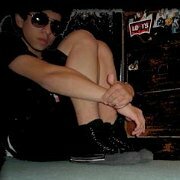 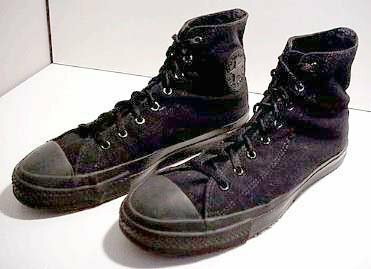 31 Monochrome Black Chucks Wearing balck monochrome high tops. 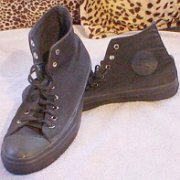 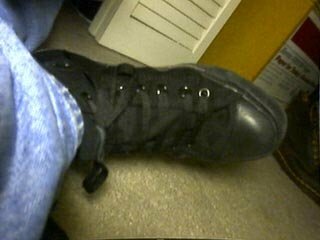 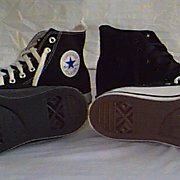 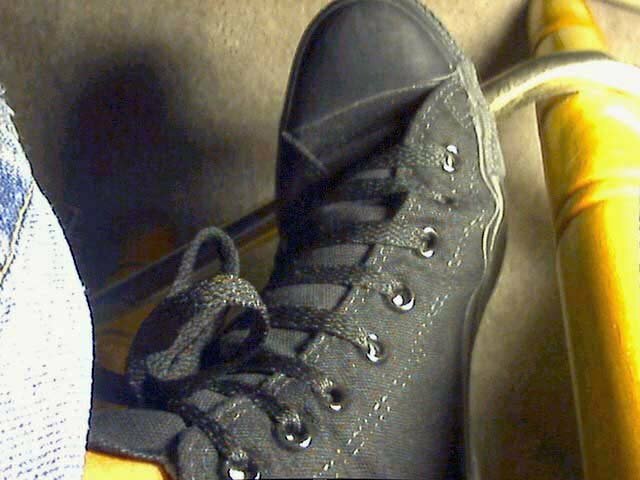 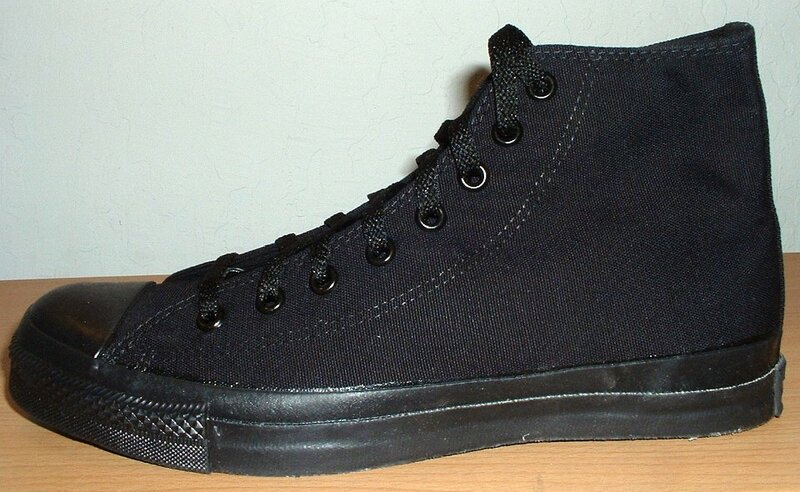 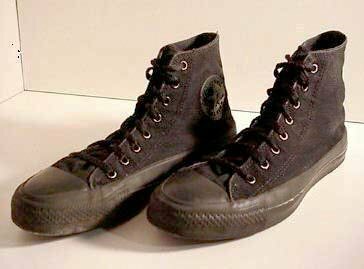 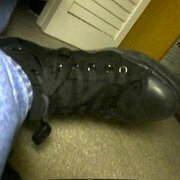 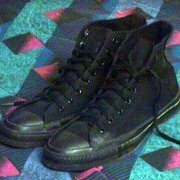 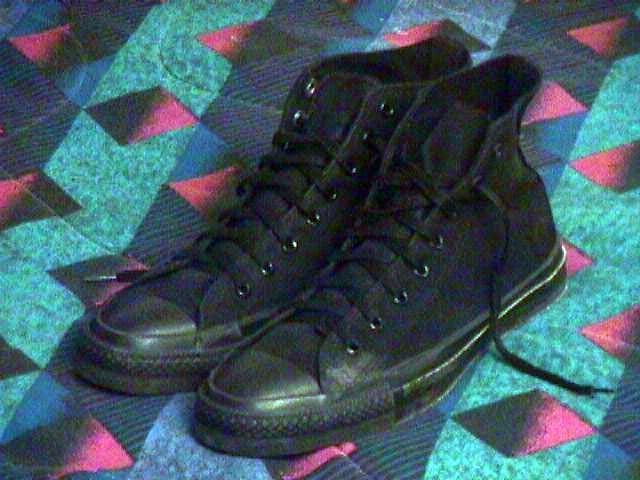 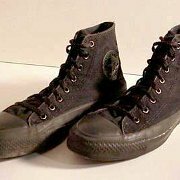 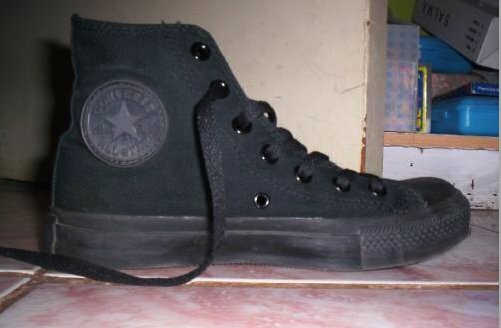 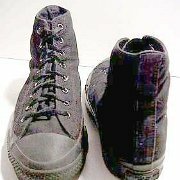 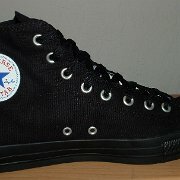 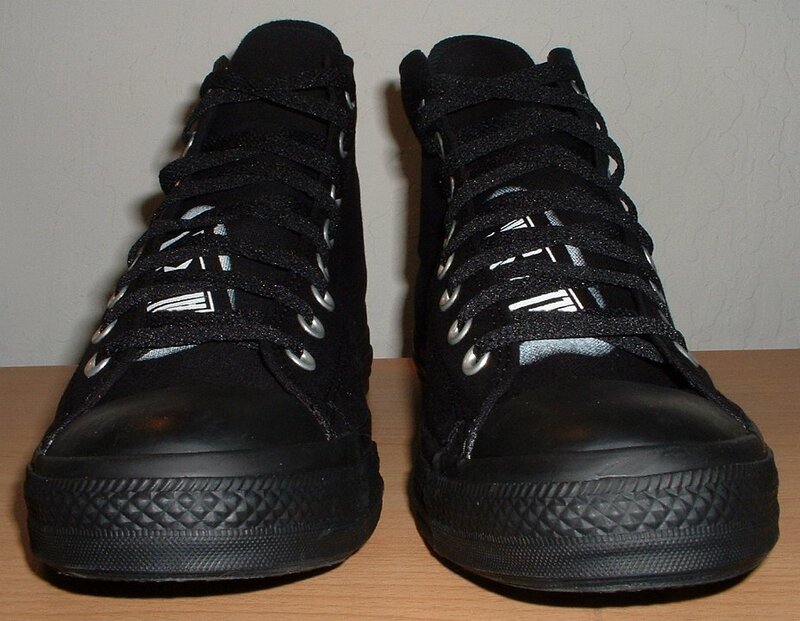 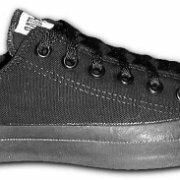 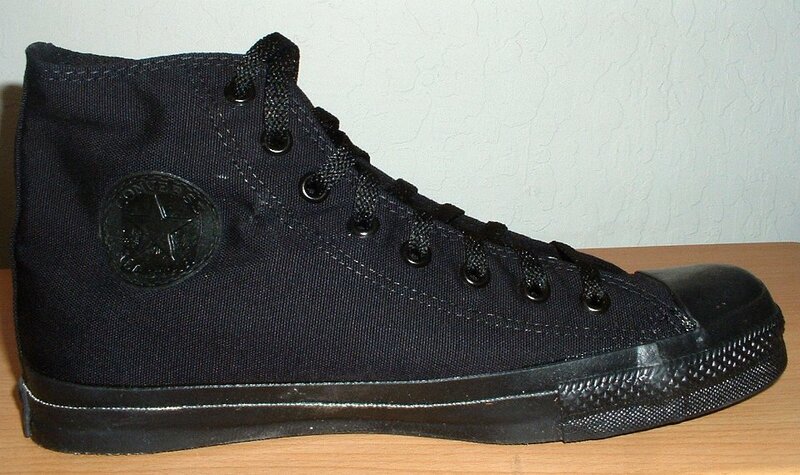 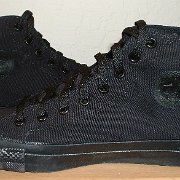 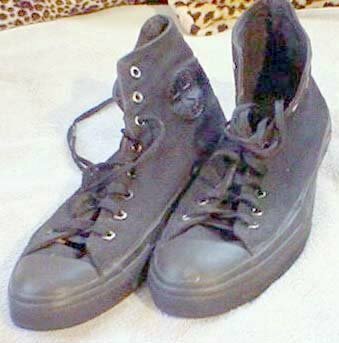 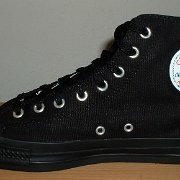 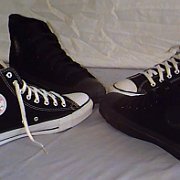 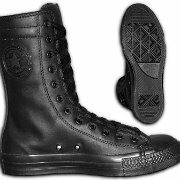 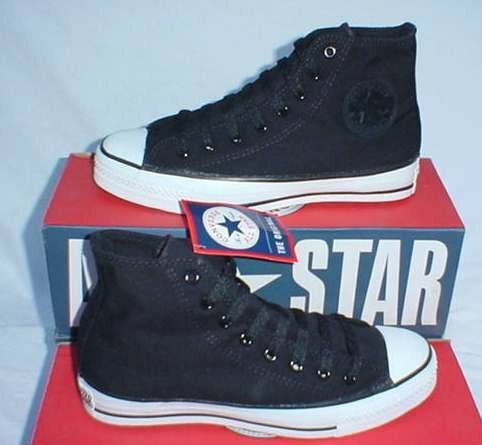 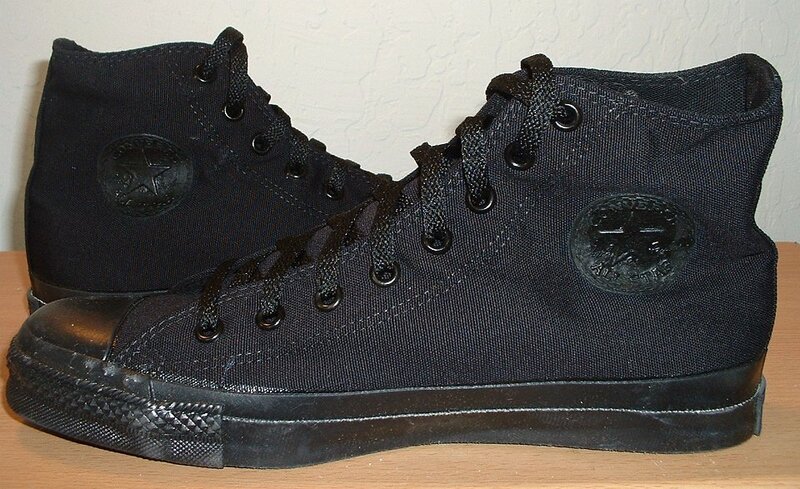 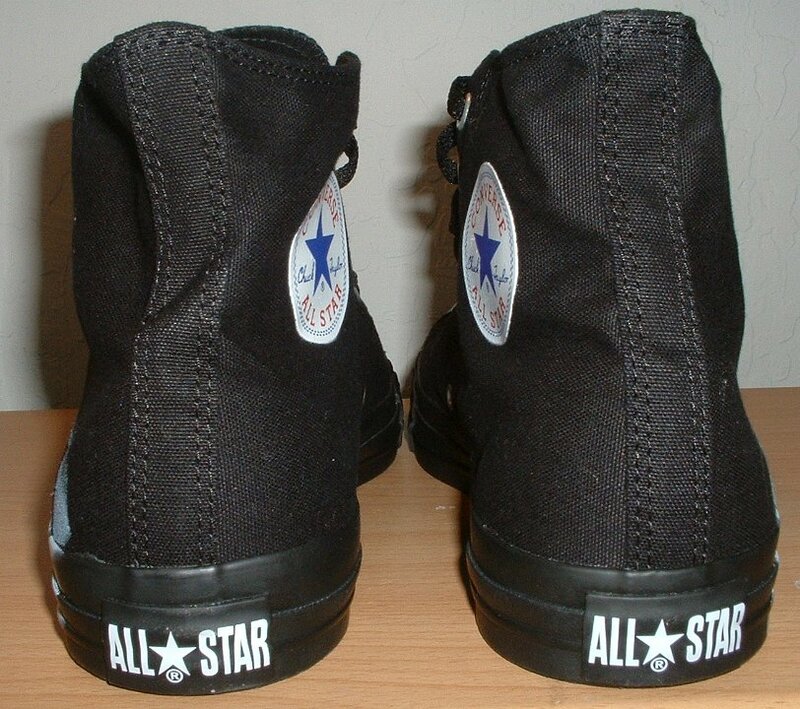 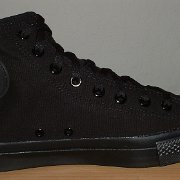 34 Monochrome Black Chucks Wearing straight-laced monochrome high tops, side view. 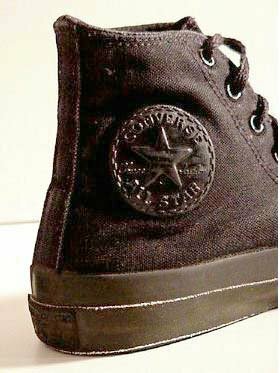 35 Monochrome Black Chucks Inside patch view of a left monochrome black high top. 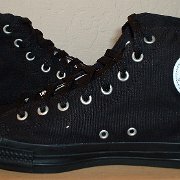 36 Monochrome Black Chucks Monochrome and regular black high top chucks, inside patch views. 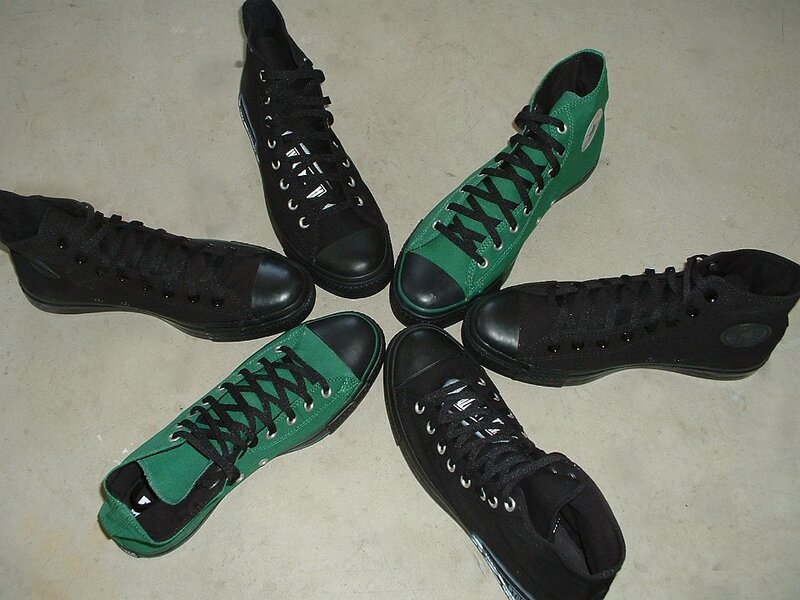 37 Monochrome Black Chucks Wheel view of new monochrome high top styles, including the traditional black, green and black goth, and stencil black. 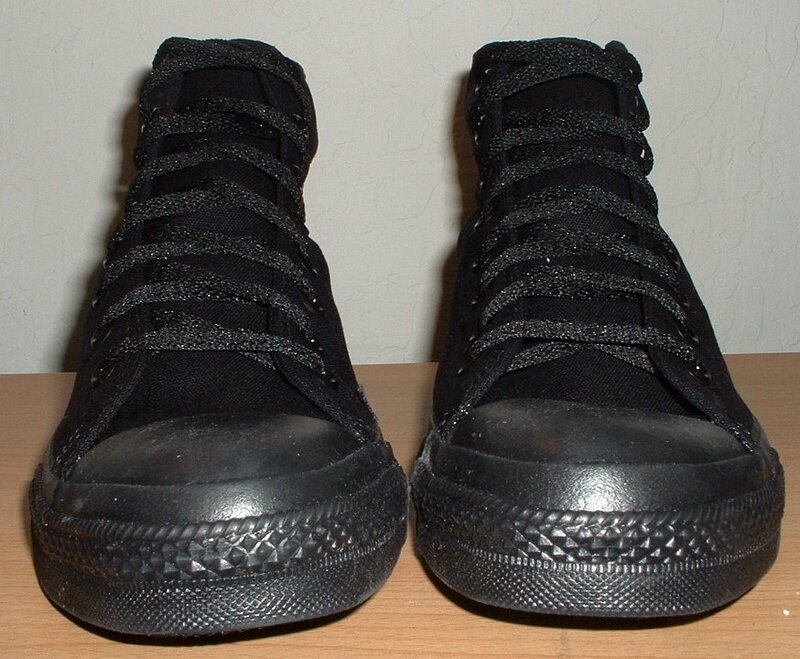 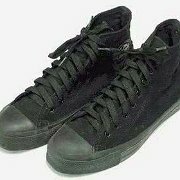 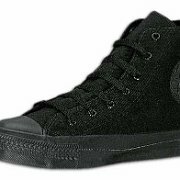 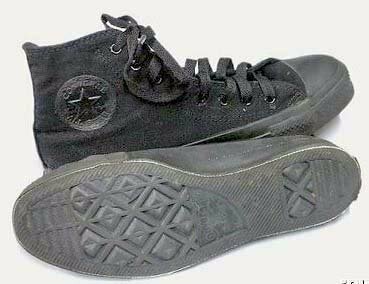 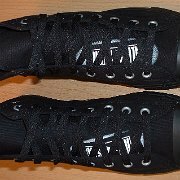 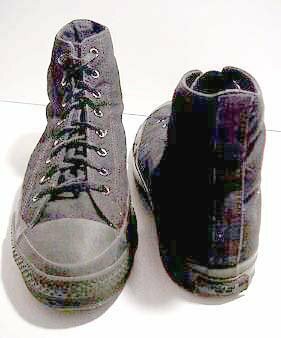 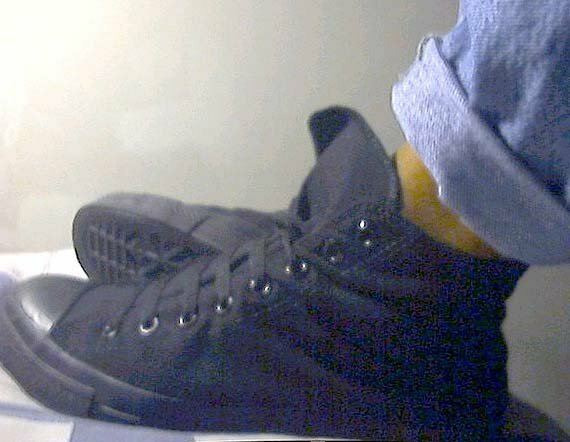 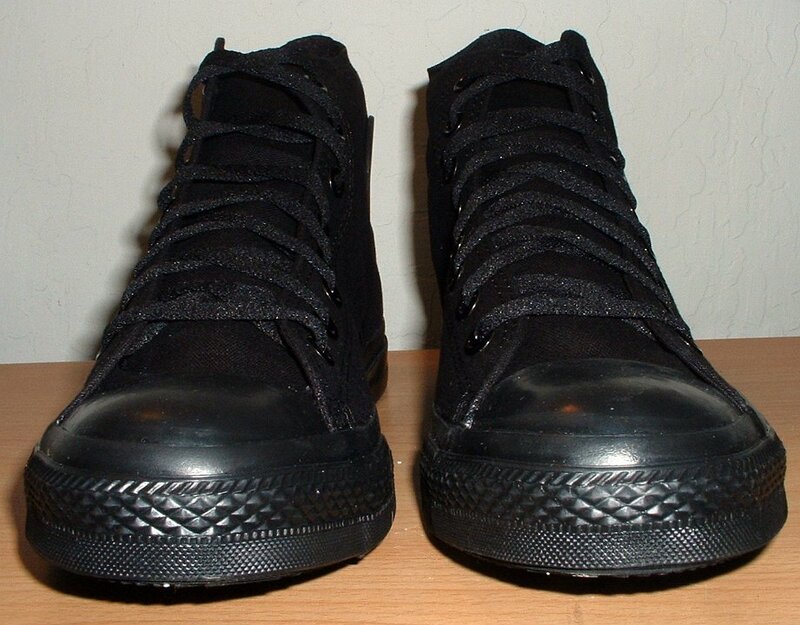 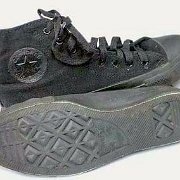 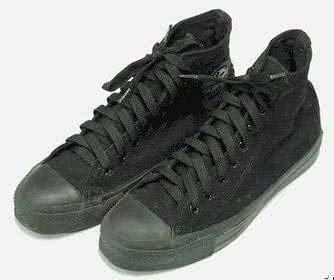 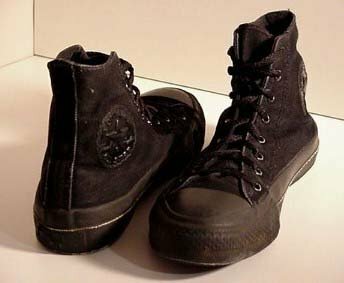 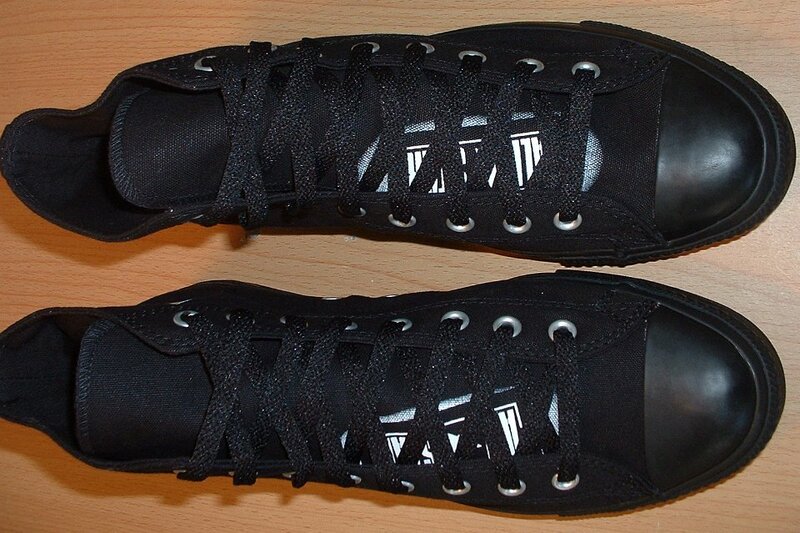 38 Monochrome Black Chucks Monochrome high tops that are a manufacturing error: monochrome uppers were placed on the standard black and white rubber outsole and foxing. 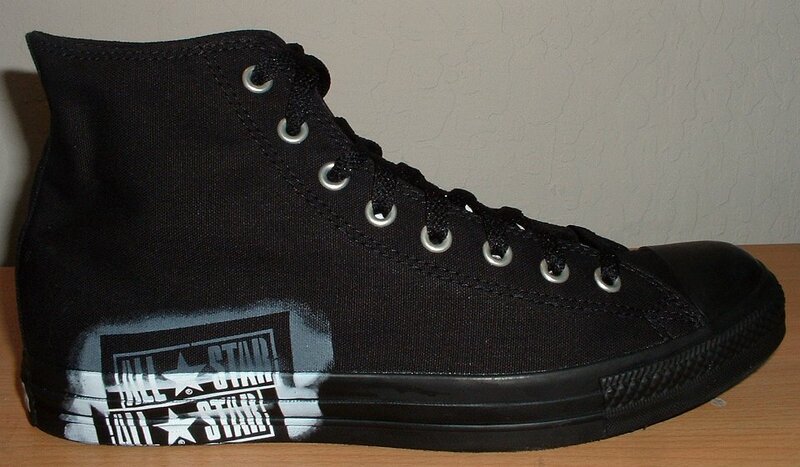 39 Monochrome Black Chucks Black stencil high top, left outside view. 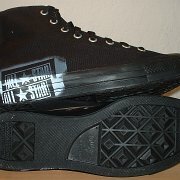 40 Monochrome Black Chucks Black stencil high top, inside left patch view. 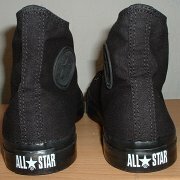 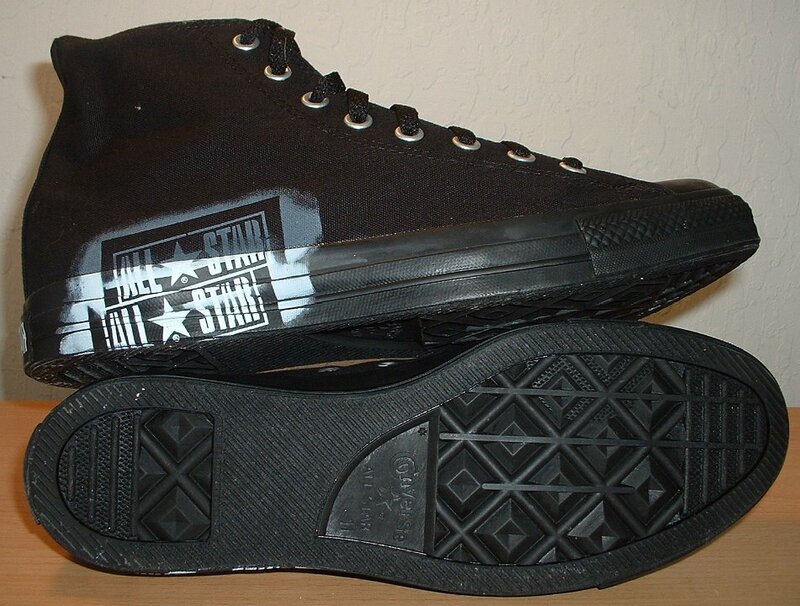 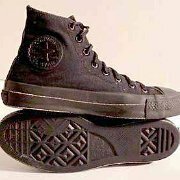 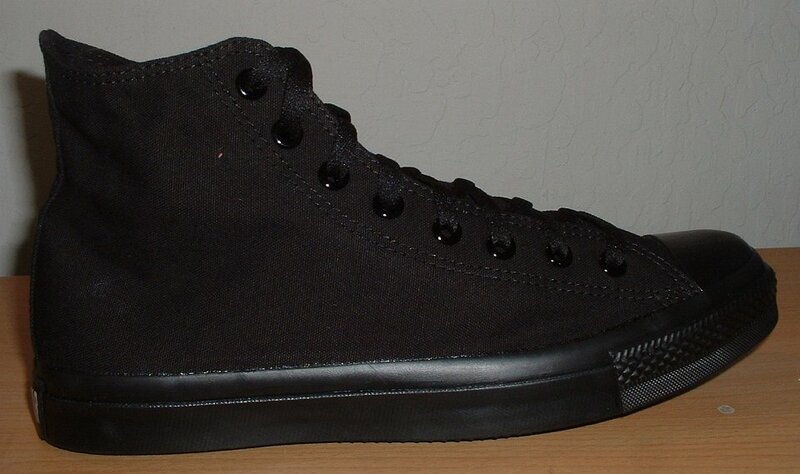 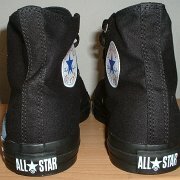 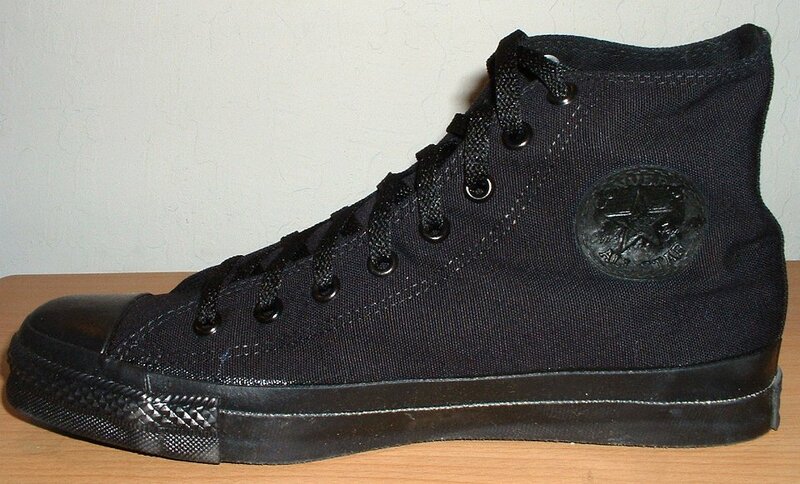 41 Monochrome Black Chucks Black stencil high top, right inside patch view. 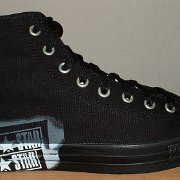 42 Monochrome Black Chucks Black stencil high top, right outside view. 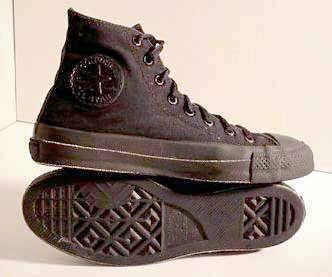 43 Monochrome Black Chucks Black stencil high tops, rear patch view. 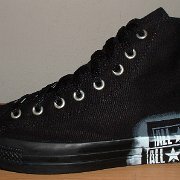 44 Monochrome Black Chucks Black stencil high tops, front view. 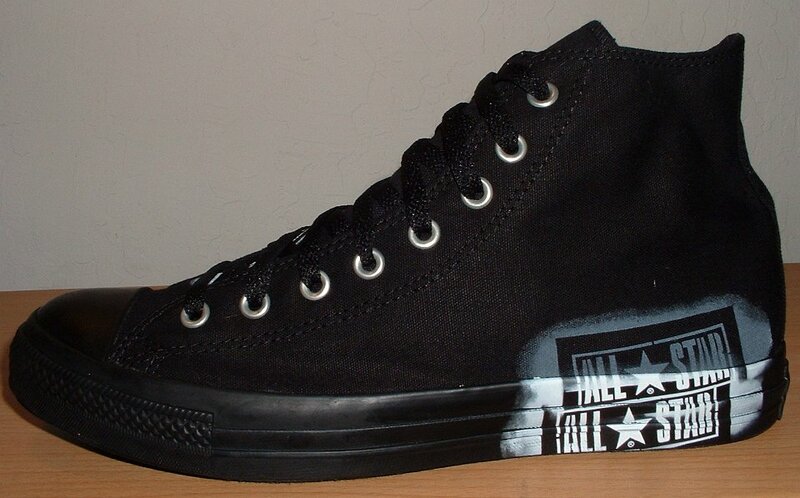 45 Monochrome Black Chucks Black stencil high tops, outer sole and right outside views. 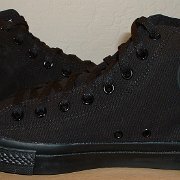 46 Monochrome Black Chucks Black stencil high tops, inside patch views. 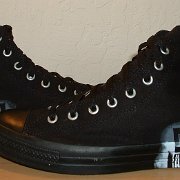 47 Monochrome Black Chucks Black stencil high tops, outside views. 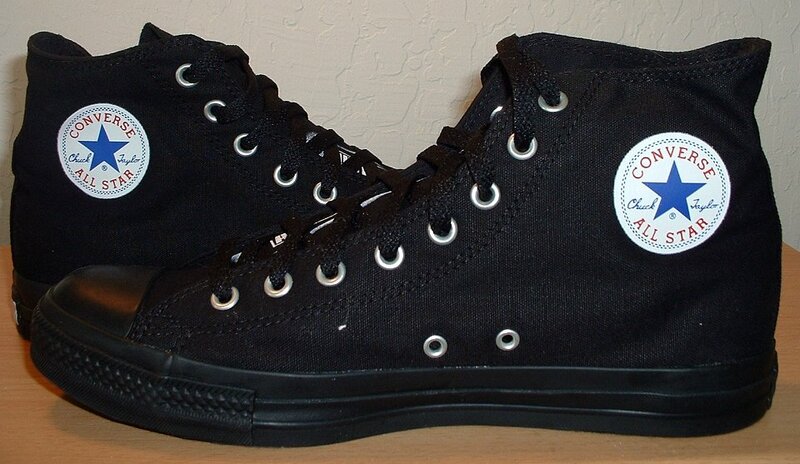 48 Monochrome Black Chucks Black stencil high tops, angled inside patch views. 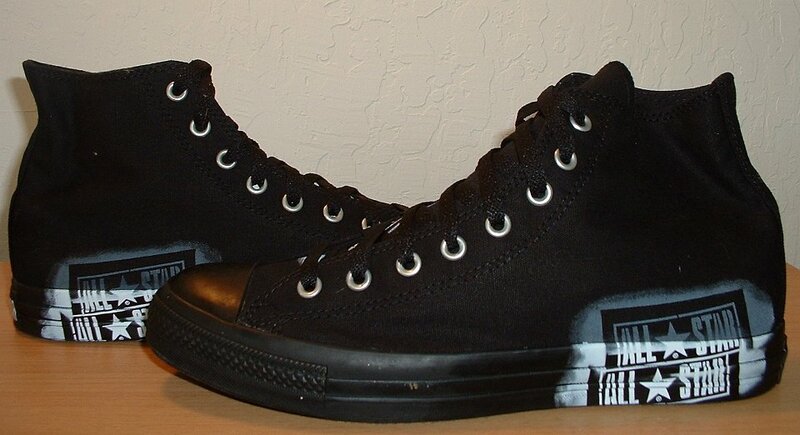 49 Monochrome Black Chucks Black stencil high tops, top view. 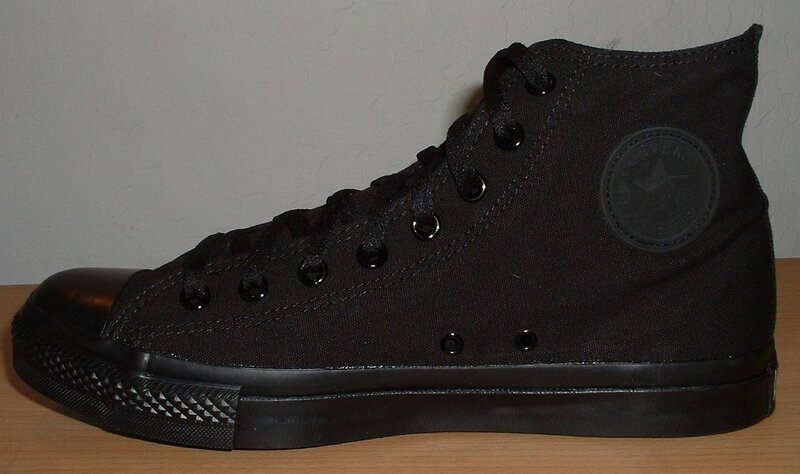 50 Monochrome Black Chucks New black monochrome high top, made in USA, left inside patch view. 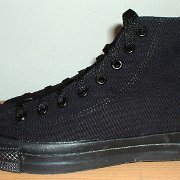 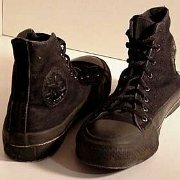 51 Monochrome Black Chucks New black monochrome high top, made in USA, left outside view. 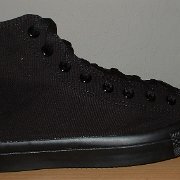 52 Monochrome Black Chucks New black monochrome high top, made in USA, right outside view. 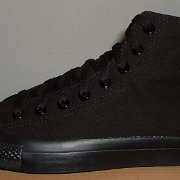 53 Monochrome Black Chucks New monochrome black high top, made in USA, right inside patch view. 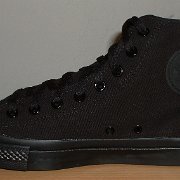 54 Monochrome Black Chucks New black monochrome high tops, made in USA, front view. 55 Monochrome Black Chucks New monochrome black high tops, made in USA, rear view. 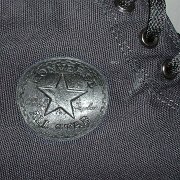 56 Monochrome Black Chucks New black monochrome high top, made in USA, closeup of the inside patch. 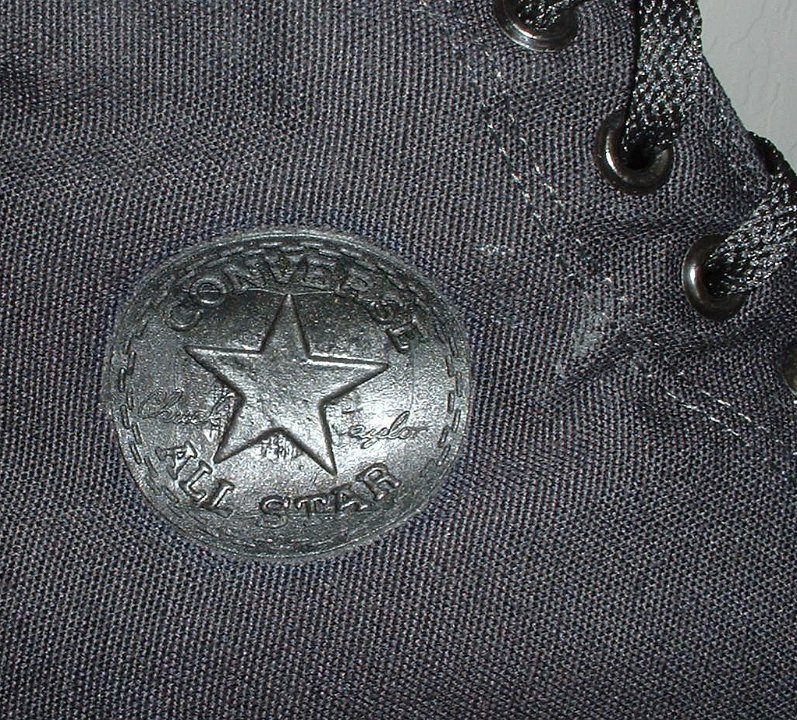 57 Monochrome Black Chucks New monochrome black high top, made in USA, closeup of the rear heel patch. 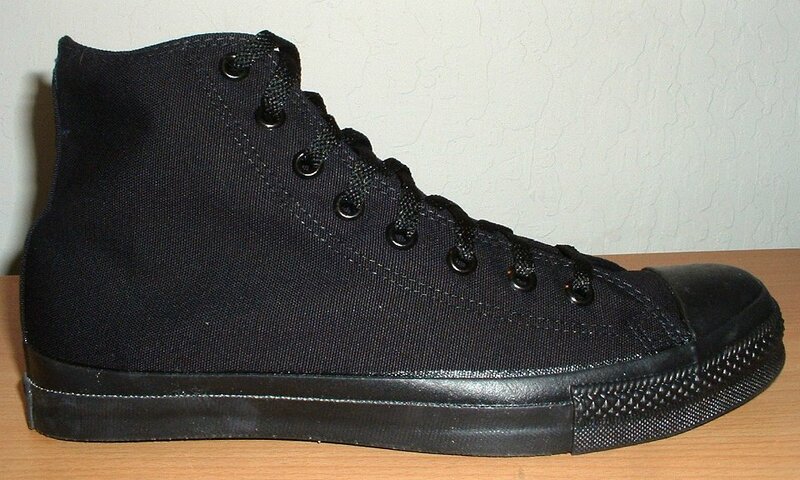 58 Monochrome Black Chucks New black monochrome high tops, made in USA, inside patch views. 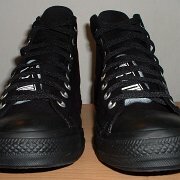 59 Monochrome Black Chucks Wearing monochrome black chucks. 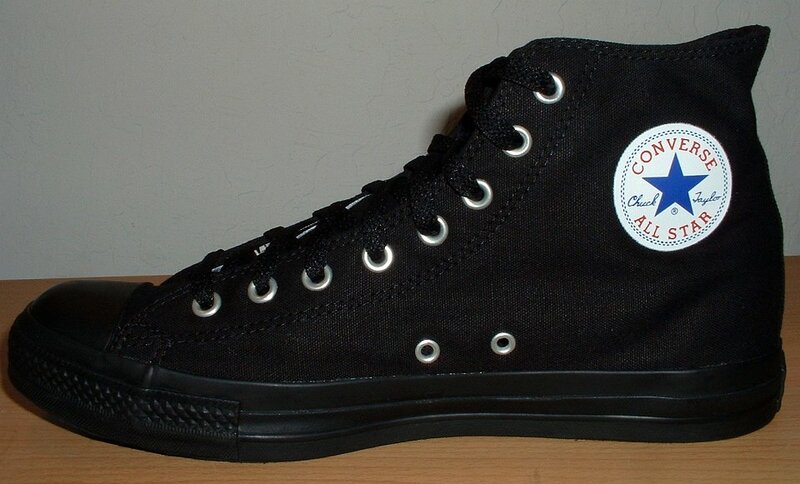 60 Monochrome Black Chucks Wearing monochrome black chucks. 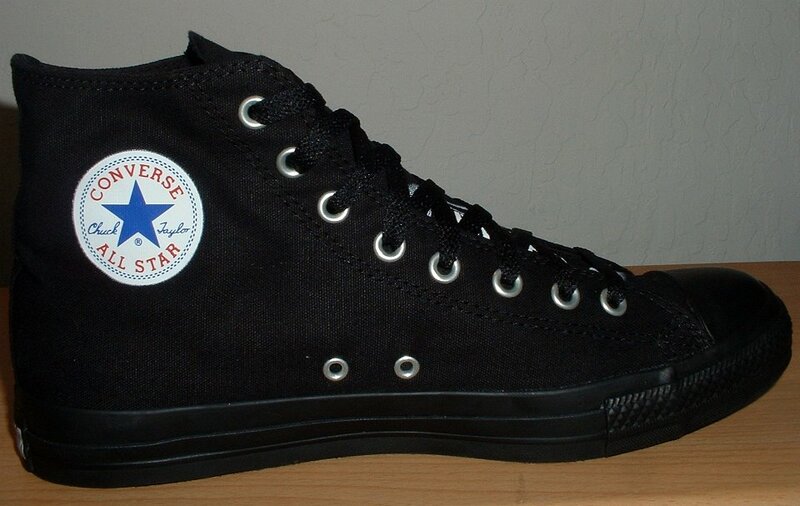 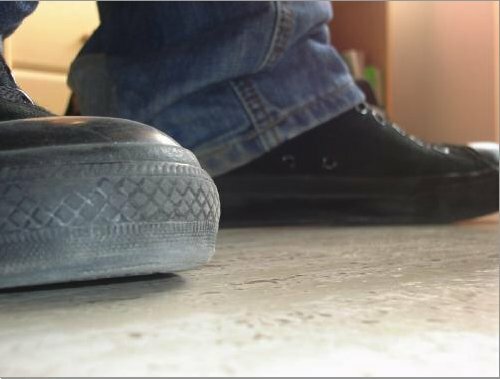 Black monochrome chucks are a solid color variation on the classic Chuck Taylor design. 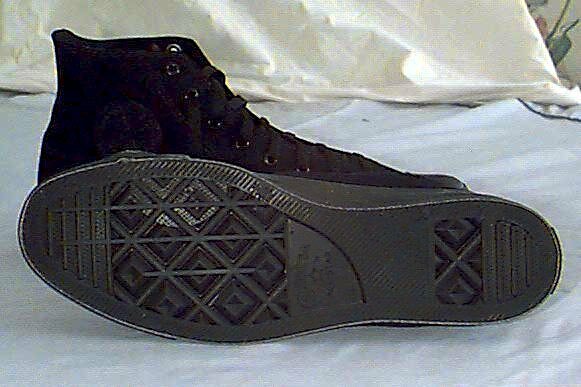 The original made in USA monochrome black models featured an all black rubber side patch and heel patch, black laces, black painted rivets, and all black outer sole and rubber foxing. 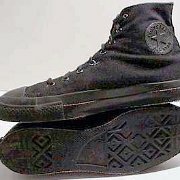 Since Converse moved the manufacture of the Chuck Taylor to Asia, some minor changes have been made in the design. 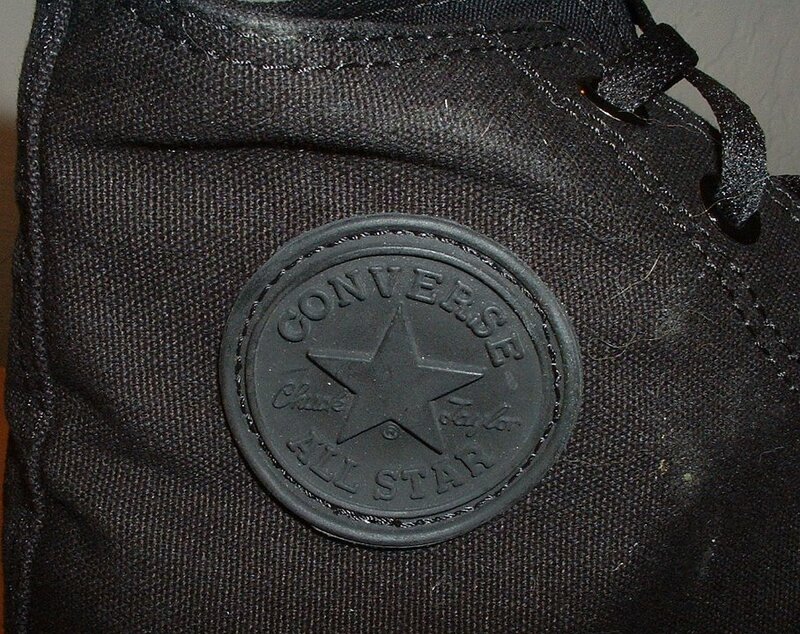 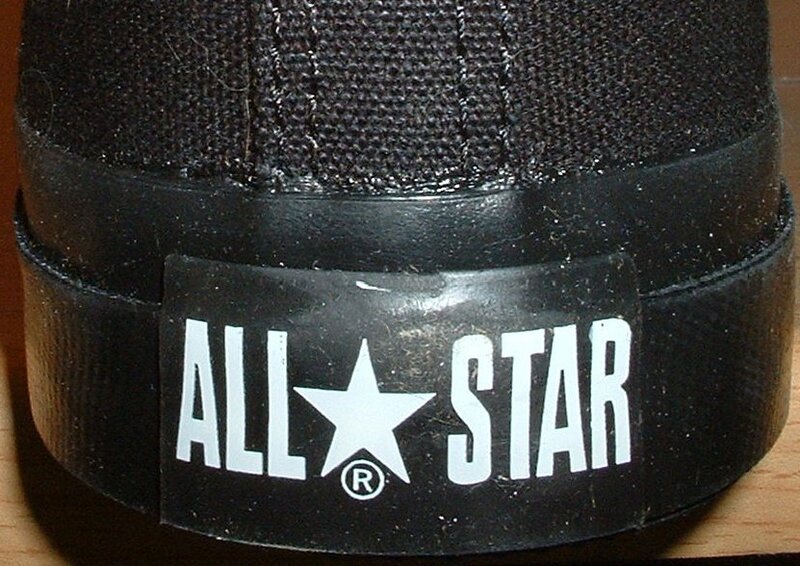 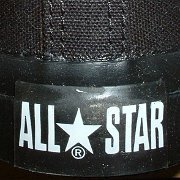 The dashed circles that outline the Chuck Taylor ankle patch logo have been replaced with circles. 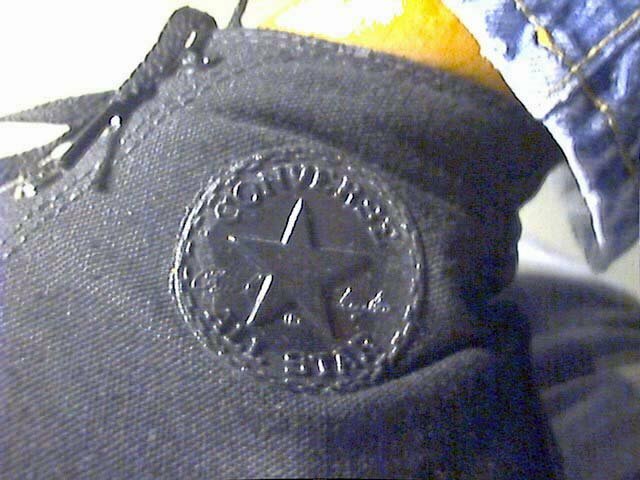 Instead of the embossed all black Chuck Taylor heel patch, the new heel patches are flat and the All Star emblem printed in white. 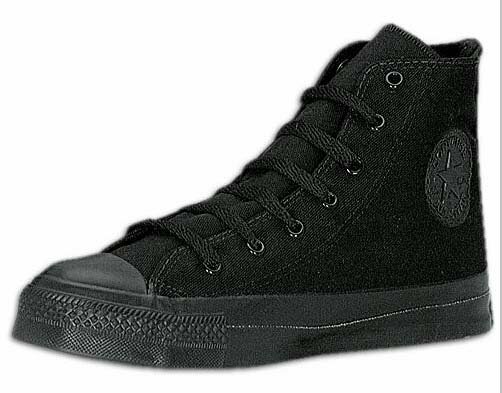 the one exception to the monochrome look. 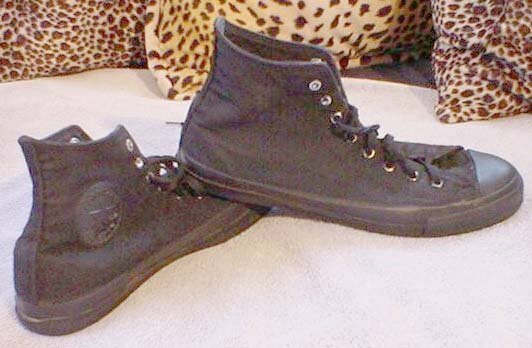 Additionally, Converse has been developing new models of Chuck Taylor shoes that use the basic monochrome look, but in a different way or in different colors. 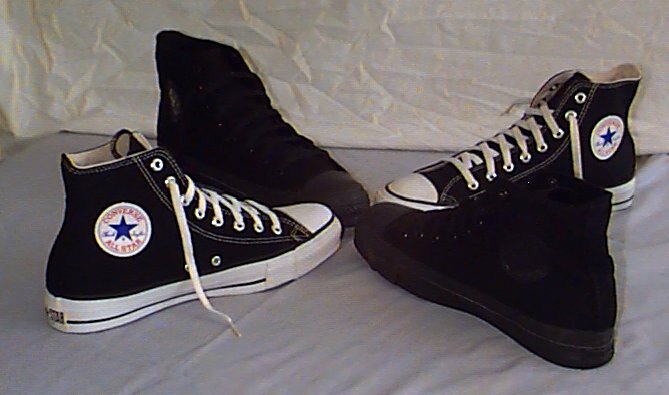 Two of these newer models are the Goth, which has now been released in four two-color combination, and the Stencil, which comes in black and red models. 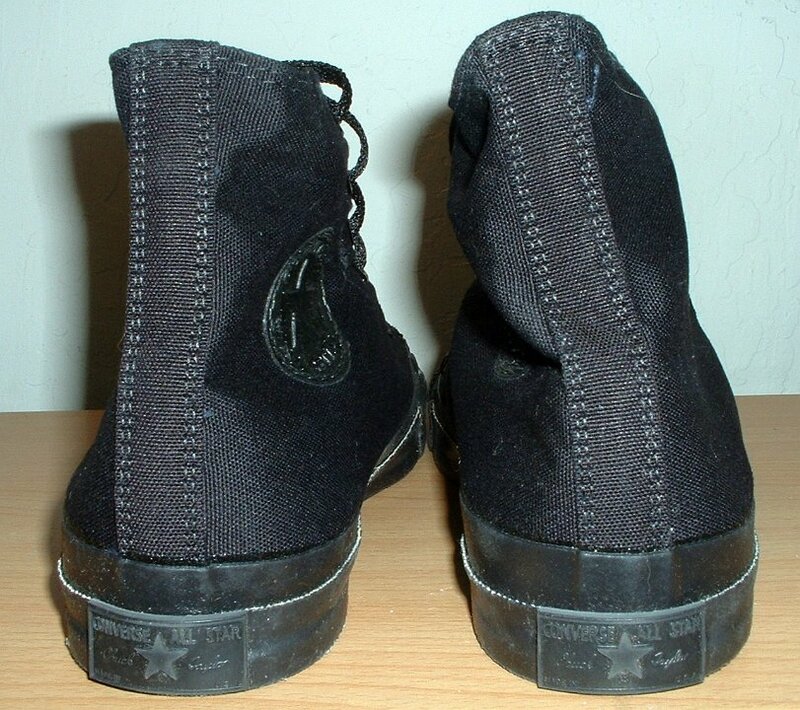 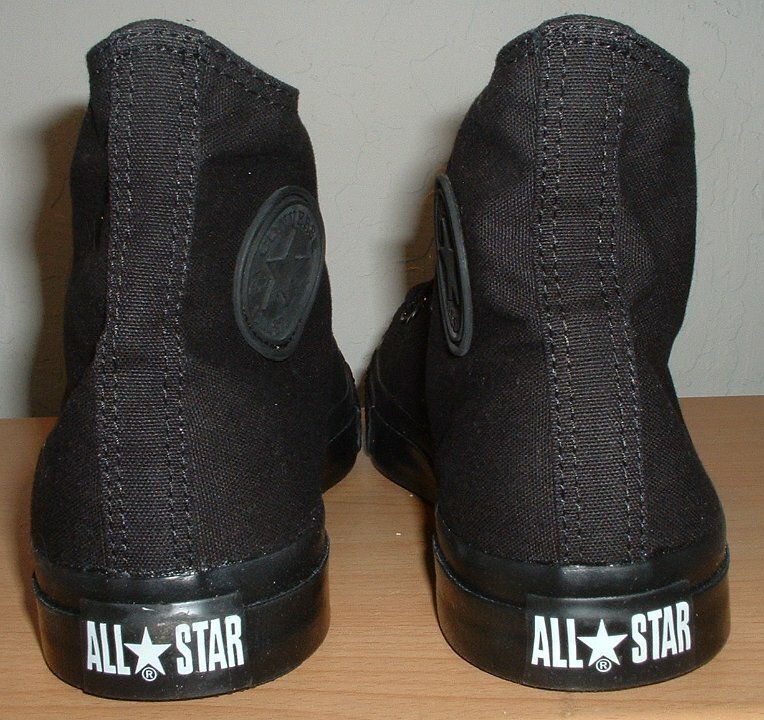 The black model is very similar to the black monochrome shoe, except that it uses a standard ankle patch, the rivets are not colored black, and it has stencilled All Star license plate logos on the outside and tongue of each shoe.